MOSCOW (Sputnik) - Russian President Vladimir Putin congratulated French President Emmanuel Macron over the phone on his side's victory in the World Cup semi-final match against Belgium on Tuesday, the Kremlin press service said on Wednesday. France beat Belgium 1-0 through defender Samuel Umtiti's only goal in St. Petersburg on Tuesday to reach the World Cup final, where they will face either England or Croatia on Sunday. 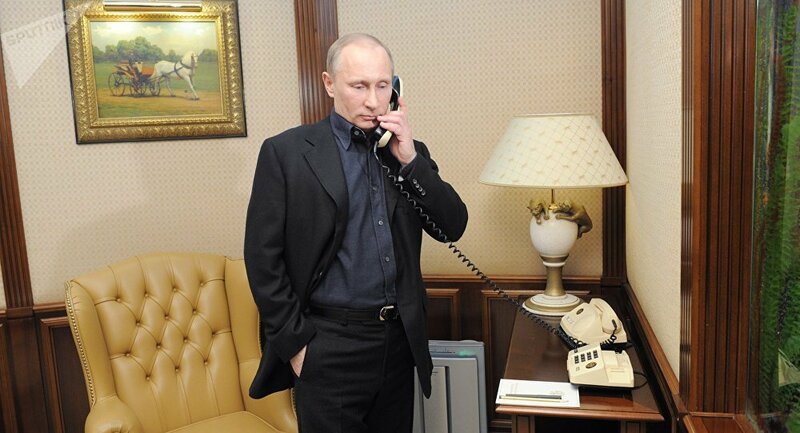 "Right after the World Cup semi-final match between France and Belgium, Russian President Vladimir Putin called French President Emmanuel Macron, who attended that match, over the phone. Vladimir Putin warmly congratulated Emmanuel Macron and all the French fans on their team's victory and qualification for the World Cup final," the press service's message said. According to the press service, Putin also contacted Belgium's King Philippe, who was present at the match, saying that "Belgium showed high-class performance throughout the World Cup." The 2018 FIFA World Cup kicked off on June 14 and will continue until July 15, with the final set to be played at Moscow's Luzhniki Stadium.